I'm gonna cast my mind way back today...and at my age that ain't easy. As we approach Halloween a couple of interweb sites I belong to are cranking themselves up over all things boo-y. Theme Thursday has chosen Halloween as it's theme today and of course Humor Bloggers Dot Boo has got their freak on - literally - all week. Drop over to both sites and follow the links for some scary stuff. Woah, woah, woah...not yet. Read my stuff first, then go there to get your monster mash. 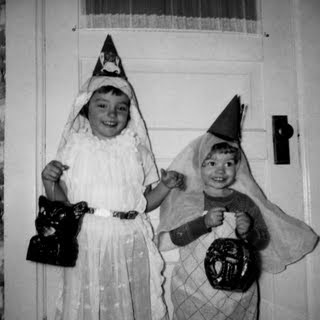 Halloween in my day used to be the time of year dentists just loved. I recall one year, several months past Halloween when I made a trip to the scariest place on earth for me - Dr. Hacking - only to discover the kindness of my neighbours and two months of lugging their largess to school for snacks had resulted in 17 cavities. After 17 fillings you can bet there was a whole lot of shaking going on. Yet if that was the worst that could happen, so what. We didn't have razor blades and pins stuck in apples back then. No, we had Tootsie Rolls, jujubes, candy kisses, licorice and Double Bubble gum. It was a whole other time. And I don't recall parents having to take me and my friends around the block. Hell, if you were six there weren't tricks. Only treats. As an adult, I took my kids out on Halloween for years, until they begged me to stop. You see, I might have brushed my teeth more often but I still loved treats. (And after 57 Halloweens it's a wonder I still have teeth.) But when you take your kids around the block you get to sample their candy on the ruse that you're inspecting it for "bad things". "Okay, let's see. It's time to make sure there's no bad things in your bag. Nom, nom, nom." I was taking my kids round the block literally AND metaphorically. Of course they're all grown up now and the grandkids are in the picture. Hmm... wonder if my daughter wants me to take the boys "round the block" this year. LOL... Forget the kids... Just go yourself. I'd give you candy, no matter how old you are. John: Ha, ha...cool, okay. I love candy. 17 cavities? Holy mercury fillings! I used to go through my boys' candy, they caught onto it quickly. "Mom, where's that Snickers bar?" I WISH my parents ate all my candy. Would have saved me a shitload of bullying. Moooooog: Yeah, I remember you! That big kid we all used to tease. i love the inspecting part...just a taste. smiles. Brian: The kids were so keen to go to the next house for more candy they didn't seem to notice my deft moves...I think. RJ: Ha! I guess we all have out favourites. My kids seem to know exactly what they have in their stash. I can't get away with taking it! Barb: These days, kids are smarter than ever. They catch on quick. Wings: Out of parental concern, I'm sure. Since Vlad's too old to go trick or treating, I just stand on the corner, offering to check out kids' candy for them. It's fun until the officers at the police station confiscate all the candy as "evidence". Perhaps I should suggest Vlad start working on the whole grandkid scheme sooner than later. Yeah, it was very different back in the day. We had neighbor ladies that made popcorn balls and caramel apples. Now, that was a sweet treat. Check this out! The word verification: karfarts - whoa, the worst kind! Me-Me: Caramel apples...mmmm. I remember...and everything else in the bag would stick to them! I love all of your postings, and you're right, it was different back in the day. Seventeen cavities, wow! The dentist must have loved that! e: Thanks, e, that's very kind. Dentists that give out cookies? They know what they're doing! And I wish I could trick or treat. Do you think anyone would notice if I took some candy as my daughter made the rounds? The Silver Fox: Sadly, times have changed. Leah: You don't have to do both. You just have to "trick" your kids out of their "treats". Yum. It was certainly fun! A local dentist here is buying wrapped Halloween candy back from trick or treaters on Tuesday for $1 per lb., and then he's sending it overseas. Huh? Why would some kid want to "earn" that candy only to sell it for half it's retail value? Just eat it and then go visit the dentist with your cavities. Everybody wins! Don: I love it. An equal opportunity dentist. Why shouldn't third world kids have cavities too? Oh man...in WHAT cruel world is there a dentist named Dr. Hacking??? That is just wrong...plain and simple! Jill: Ah, someone finally clued in! With any luck, you'll get to help your grand kids toss out the "bad" candy. Loved the pictures. Ronda: Oh, yeah, I'm there for them! Really good post I haven't heard anyone refer to JuJubes since I don't know when. My favorite candy along with Smarties It was a great time, wasn't it? I negotiate with the kids...the longer they go out, the more I get to sift through their take to find what I need. It's a pecking order sort of deal. California Girl: It was a great, great time. Brian: I'm thinking they must go out for a long, long time? My kids know that if they want their Reese's Peanut Butter Cups, they gotta eat 'em before I get to 'em. DK: Peanut Butter Cups - mmm... one of my favourites! Oh yes, the good old days. We went out with pillow cases to hold all the goodies. Full size candy bars, homemade treats, cans of soda. My dad was an official halloween candy inspector too. Some things never change. Dreamhaven: Hey, these things are handed down from one generation to the next. Where do you think I got the idea from?